This fact sheet provides an overview of felony disenfranchisement policies and implications, including a state-by-state table illustrating the categories of individuals disenfranchised due to a felony conviction. Since the founding of the country, most states in the U.S. have enacted laws disenfranchising people currently or previously having been convicted of a felony. In the last 40 years, due to the dramatic expansion of the criminal justice system, these laws have significantly affected the political voice of many American communities. The momentum toward reform of these policies has been based on a reconsideration of their wisdom in meeting legitimate correctional objectives and the interests of full democratic participation. 48 states and the District of Columbia prohibit voting while incarcerated for a felony offense. 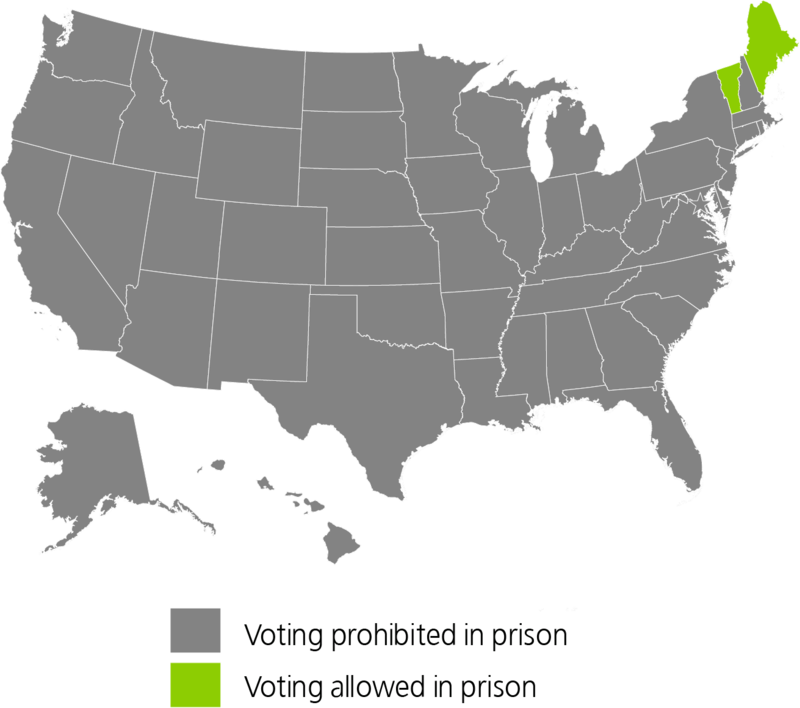 Only two states – Maine and Vermont – permit persons in prison to vote. 35 states prohibit persons on parole from voting and 31 of these states exclude persons on probation as well. Four states deny the right to vote to all persons with felony convictions, even after they have completed their sentences. Eight others disenfranchise certain categories of ex-offenders and/or permit application for restoration of rights for specified offenses after a waiting period (e.g., five years in Wyoming, and two years in Nebraska). Each state has developed its own process of restoring voting rights to ex-offenders, but most of these restoration processes are so cumbersome that relatively few persons are able to take advantage of them. An estimated 5.85 million Americans, or one in forty adults, have currently or permanently lost their voting rights as a result of a felony conviction. 2.2 million African Americans, or 7.7% of black adults, are disenfranchised, compared to 1.8% of the non-African American population. In three states – Florida (23%), Kentucky (22%), and Virginia (20%) – more than one in five African Americans is disenfranchised. Given current rates of incarceration, three in ten of the next generation of black men can expect to be disenfranchised at some point in their lifetime. 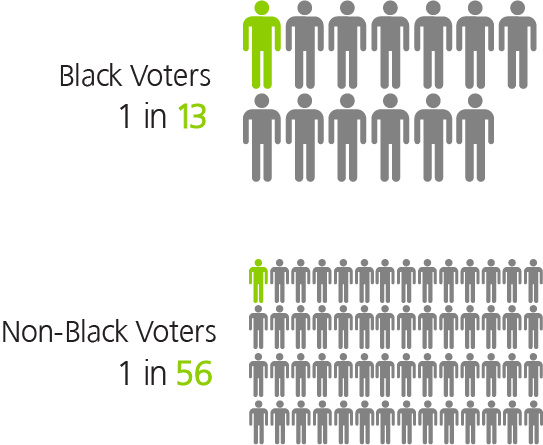 In states that disenfranchise ex-offenders, as many as 40% of black men may permanently lose their right to vote. 2.6 million disenfranchised persons have completed their sentences, comprising 45% of the total disenfranchised population. In 2003, Governor Riley signed into law a bill that permits most felons to apply for a certificate of eligibility to register to vote after completing their sentence. In 2001, Governor Rowland signed into law a bill that extends voting rights to felons on probation. The law made 36,000 persons eligible to vote. In 2000, the General Assembly passed a constitutional amendment restoring voting rights to some ex-felons five years after the completion of their sentence. In 2013, the five-year waiting period was eliminated for most offenses. In 2007, the Office of Executive Clemency voted to amend the state’s voting rights restoration procedure to automatically approve the reinstatement of rights for many persons who were convicted of non-violent offenses. This decision was reversed in 2011, and persons seeking rights restoration must now wait at least five years after completion of sentence. Governor Vilsack issued an executive order in 2005 automatically restoring the voting rights of all ex-felons, but this order was rescinded by Governor Branstad in 2011. In 2002, the Legislature added probationers to the category of excluded felons. In 2001, the Legislature passed a bill that requires that the Department of Corrections inform and aid eligible offenders in completing the restoration process to regain their civil rights. In 2007, the Legislature repealed all provisions of the state’s lifetime voting ban, including the three-year waiting period after completion of sentence for certain categories of offenses, and instituted an automatic restoration policy for all persons upon completion of sentence. In 2000, the Massachusetts electorate voted in favor of a constitutional amendment, which strips persons incarcerated for a felony offense of their right to vote. In 2005, the Legislature repealed the lifetime ban on all felons and replaced it with a two-year post-sentence ban. In 2003, the state approved a provision to automatically restore voting rights for first-time nonviolent felons immediately after completion of sentence. In 2001, the Legislature adopted a bill repealing the state’s lifetime ban on ex-felon voting. In 2005, a bill was passed that requires the Department of Corrections to provide notification of completion of sentence to the Secretary of State’s office. In 2006, Rhode Island voters approved a referendum to amend the state constitution and restore voting rights to persons currently serving a sentence of probation or parole. In 2006, the Tennessee legislature amended the country’s most complex restoration system by greatly simplifying the procedure. All persons convicted of a felony (except electoral or serious violent offenses) are now eligible to have their right to vote restored upon completion of sentence and may apply for a “certificate of restoration” from the Board of Probation and Parole. All applicants must also satisfy any court-ordered restitution or child support obligations. In 1997, the Texas Legislature passed a bill, signed by Governor George W. Bush, eliminating the two-year waiting period after completion of sentence before individuals can regain their right to vote. In 1998, Utah voters approved an amendment prohibiting persons incarcerated for a felony conviction from voting. The Virginia legislature passed a law in 2000 enabling certain ex-felons to apply to the circuit court for the restoration of their voting rights five years after the completion of their sentence; those convicted of felony drug offenses must wait seven years after completion. In 2013, Governor McDonnell adopted a policy of rights restoration for non-violent ex-felons without requiring an application. In 2009, Governor Gregoire signed a bill that eliminated the requirement of paying all fines, fees, and restitution before regaining the right to vote. In 2003, Governor Freudenthal signed a bill to allow people convicted of a non-violent first-time felony to apply for restoration of voting rights five years after completion of sentence. Sources: Jamie Fellner and Marc Mauer, Losing the Vote: The Impact of Felony Disenfranchisement Laws in the United States, Human Rights Watch, The Sentencing Project, October 1998; Nicole D. Porter, Expanding the Vote: State Felony Disenfranchisement Reform, 1997-2010, The Sentencing Project, October 2010, updates by The Sentencing Project, and Jeff Manza and Christopher Uggen, Locked Out: Felony Disenfranchisement and American Democracy, 2006. * Failure to satisfy obligations associated with convictions may result in post-sentence loss of voting rights.